The detail was cut from my submission that this TV cartoon for young girls was broadcast in Japan from January 11th to March 29th, 2017, at 1:35 a.m. (!). How late do young girls stay up in Japan? Sorry, cannot take this show seriously. Well, that's okay, I'm guessing "seriously" was not the tone they were going for. I am just sick and tired of the "little anime girl" thing. I wish it would go away. It’s been around since “Sally the Witch” in 1966. I wrote a column for Cartoon Research in October 2013 on the “Magical Little Girls”. There are dozens of ‘em from practically every Japanese animation studio. They’re here to stay. My comment seems to have vanished. I checked out the first episode, decided to watch the rest. Got up to I think episode 5 or 6 before I had to leave work. It is interesting and cutesy, and I'm intrigued by the implied Post-Apocalyptic backstory. I finished streaming the series on Crunchyroll some time ago. 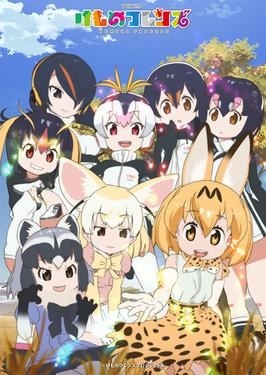 Yes it starts like a overtly kawaii anime for the younger set , yet the show held my interest not just the cute furriness but also post apocalyptic underlying mystery about Japari Park, the friends and Kaban herself. I fully expect this show to be a huge hit when it comes to the U.S.